Syriza won handily in Sunday's Greek election. What lessons are to be drawn from the results? 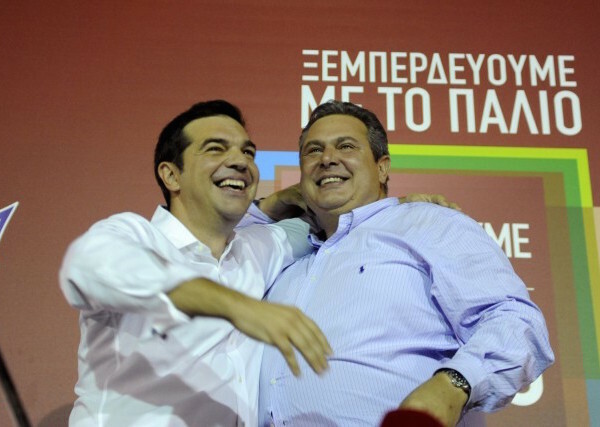 Greek Prime Minister Alexis Tsipras and the leader of ANEL, Syriza's coalition partner, celebrate their return to power on Sunday. This was not a good election night. I am not talking mainly about the fact that Popular Unity failed to pass the 3 percent threshold necessary to gain parliamentary representation, but rather that the election results seem like a vindication of Syriza’s capitulation to the European Union and the signing of the new memorandum. The new loan agreement will mean devastating cuts and neoliberal reforms, and we now have a parliament dominated by pro-memoranda forces to see it all through. This is in sharp contrast to the July referendum, when millions massively rejected troika-imposed austerity and the social devastation that came with it. Tsipras’s cynical gamble was that he could turn the election into a debate on what party (and prime minister) will implement the memorandum that had already been approved by Syriza and the systemic parties on August 14. His strategy was to present the memorandum as something inescapable and inevitable. He avoided much mention of the agreement, presenting the only possible choices as being between him and Vangelis Meimarakis, the leader of the center-right New Democracy party. The fact that the Independent Greeks managed to enter parliament offered Tsipras the opportunity to form another coalition government with them. As for the other systemic pro-memoranda parties, New Democracy did not manage to challenge Syriza effectively, especially since it is still held responsible for being part of ruling pro-memoranda austerity coalitions since 2011. Pasok managed to improve on its January performance, but the fact that the Independent Greeks managed to enter parliament meant that Syriza was no longer in need of their backing. The River, an openly neoliberal party (the basic representative of the “extreme center” in Greek politics) lost one-third of its support. At the same time, the dramatic increase in abstention, with 773,000 less voters than in the January election, is an expression of the political crisis and in particular the widespread sense of defeat among Greek workers. Another expression of this disillusionment with the political scene was the 3.4 percent vote in favor of the Center Union. That party’s leader, Vasilis Leventis, is well-known for offering his “political analyses” on a second-rate TV channel in the 1990s. His work was viewed as a form of comedy, and no more seriously than that, but now the Center Union has emerged as one of the main outlets of an “anti-political” protest vote. At the same time, the neo-Nazis of Golden Dawn, whose leader cynically acknowledged political responsibility for the murder of anti-fascist artist Pavlos Fyssas, increased their percentage — though because of reduced participation, the party actually received slightly fewer votes than in January. Popular Unity, of course, did not fare well on Sunday. With 2.86 percent it did not manage to gain parliamentary representation. This is an obvious political failure, especially considering the fact that it started as a mass split in Syriza and was one of the main political forces that insisted on the relevance of the “no” vote. At the same time, Antarsya managed to have an increase both in votes and percentage, reaching 0.85 percent. What explains Popular Unity’s performance? Here are just a few quick thoughts, since the discussion of the result has just started. Popular Unity underestimated that a great part of the defeated and betrayed “people of the No” voted not to signal continued resistance but within the limits of a “nothing can really change” mentality, opting to accept Tsipras’s call for a “second chance” and let Syriza rather than New Democracy oversee the new memorandum. Popular Unity thought that the split in the party would have also meant a proportional split in the electoral following of Syriza. But in reality, the relations of representation proved to be more complex. The fact that there was a delay and backtracks regarding the exit from Syriza never helped things either. Popular Unity also failed to effectively appeal to the anger of a youth with no future and to the silent feeling of despair and disappointment that led many voters to abstention or choices such as the Center Union. We did not manage to turn Popular Unity into the necessary new front, the kind of front that would engage seriously in debate and in action about the problems inherited from Syriza. We seemed more like a variation of a Syriza that would have been faithful to its principles, rather than a new front coming organically from the movement and the dynamics of social antagonism. The lack of self-criticism regarding the participation of Left Platform members in the Syriza government also contributed to this image. We failed during the campaign to insist on what perhaps was our strongest point, namely the fact that we had an alternative narrative regarding the annulment of debt and exit from the eurozone. People wanted to hear a complete program and a road map for the exit from the eurozone, not simply anti-austerity and anti-memoranda rhetoric. Popular Unity failed to open up to all forms of radicalism emerging out of the crisis of Syriza and also from the experiences of the movement. Moreover, the actual problems of communication between different sensitivities and varieties of left radicalism, both inside and outside Syriza, remained, including the fact that the Left Platform leadership was more suspicious than it should have been of other tendencies and failed to realize the need for an open appeal to all potential Popular Unity participants. Moreover, the formation failed to offer enough guarantees that it would be open and democratic, free of the bureaucratic logic that plagued Syriza. However, the elections are over. Ahead of us are the implementation of the third memorandum and a new round of aggressive austerity and neoliberal reforms. We are facing the challenge of rebuilding the movement and also the confidence in the ability of the movement to win. At the same time, Popular Unity and the entire radical left (which also includes Antarsya, people that left Syriza but remained out of Popular Unity, critical voices from the milieu of the Communist Party, and people from social movements) must go through the necessary (and necessarily painful) process of self-criticism and rereading of the conjuncture in an attempt to reinvent the radical left as a counter-hegemonic project. This will be a difficult task, but it’s nothing new: left politics is all about building a boat while you’re already at sea in rough waters. Panagiotis Sotiris is a member of Popular Unity. Syriza won handily in Sunday’s Greek election. What lessons are to be drawn from the results?